More Splatfest action is heading our way very shortly. A Smash Bros. Splatfest event for Splatoon 2 is set to celebrate the impending arrival of Super Smash Bros. Ultimate. The official Splatoon 2 Tumblr dished out the details. The theme has you choose a side: Team Heroes, who fight for good, or Team Villains, who will, naturally, fight for evil. The event will start on December 14th starting at 8:00 p.m. PT and will run through December 15th, ending at 8:00 p.m. PT. The blog post mentions that any Super Sea Snails that you obtain must be picked up by the afternoon of December 20th. A future Splatfest is set for January 4th where you’ll choose between spending the holidays with friends or spending them with family. In addition, Inkopolis Square and stages will have a new winter-themed setting, along with glitter-filled ink for Octolings. This event starts at 2:00 p.m. PT and will run through January 6th at 2:00 p.m. PT. New weapons and items will also be distributed starting in late December. Players will obtain items such as New Year’s Glasses DX, Twisty Headband, Festive Party Cone and Eel-Cake hat. Super Smash Bros. Ultimate is set to be released tomorrow, December 7, for the Nintendo Switch. 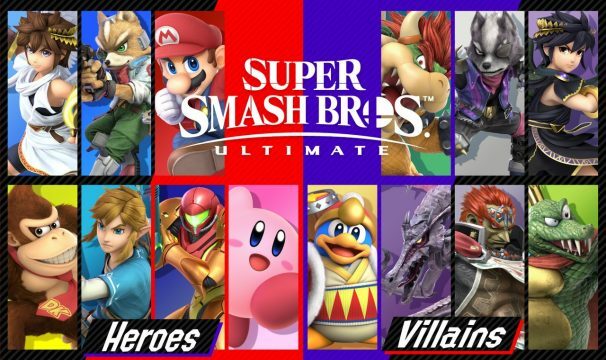 It will boast 74 playable characters upon release, featuring new fighters King K. Krool, Simon Belmont from the Castlevania series, and Isabelle from the Animal Crossing series.